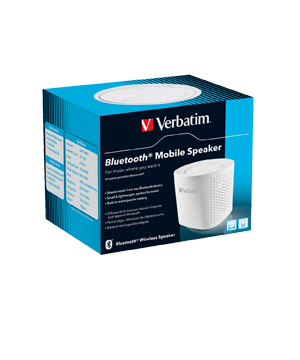 Verbatim Compact Bluetooth Mobile Speaker allows you to connect and stream music from your Mobile Phone, iPads PC's and notebook computers. It is lightweight and portable by built in rechageable battery or via USB making it a travel essential. With a wirless range of to 10 meters and can play back music up to 6 hours (Depends on the connected Bluetooth device). Also comes with 3.5mm jack stereo audio cable and USB cable.